If trees make all our oxygen, what's the minimum number of trees/plants needed to support the current volume of life on Earth? I would like to be able to answer this question but it is very complex. To give you an answer the following information would be relevant. 1, Different tree species produce different amounts of oxygen so you might have to start with some kind of average. Many of these species have not been studied for the amount of oxygen they produce either. 2, Of course trees and plants are not the only producers of oxygen. 3, You would also have to know the same kind of information about the amounts of oxygen used by various different species, an Elephant would use more then a Mouse for example. Maybe another average? Thanks. Excuse my ignorance, but what else produces oxygen? Phytoplankton is high on the list. I think it produces about half the oxygen. It is not as much that trees produce oxygen, as convert carbon dioxide & water into hydrocarbons & free oxygen (and other molecules). Grass is essentially on an annual cycle. It grows. It is then either eaten, or decomposes. And regrows again the next year. But, essentially 100% of it is broken down and regeneratered during the annual cycle. Trees may last longer. Perhaps a few hundred years. The question then is what happens to all the carbon they've locked up. If you put it into the framing of a house, it may endure for hundreds of more years. If it rots on the forest floor, perhaps a few decades before the carbon is released back into the atmosphere. A fire may release it immediately. Cutting down a tree isn't a problem if it is regrown. Slash burning forest land to create crop land. The crops still participate in the carbon cycle, but all CO2 from the woody matter is released into the atmosphere as a one-time bolus. If it was just a matter of eating and breathing, then our crops would be sufficient for our own carbon cycle. Since the discovery of coal and oil, and with the extraordinary human population growth over the last 10,000 years or so, we've managed to increase the atmospheric carbon dioxide from about 0.03% of the atmosphere to about 0.04%. At the same time, we've likely decreased the atmospheric oxygen by a similar amount, or from about 20% to 19.99%. 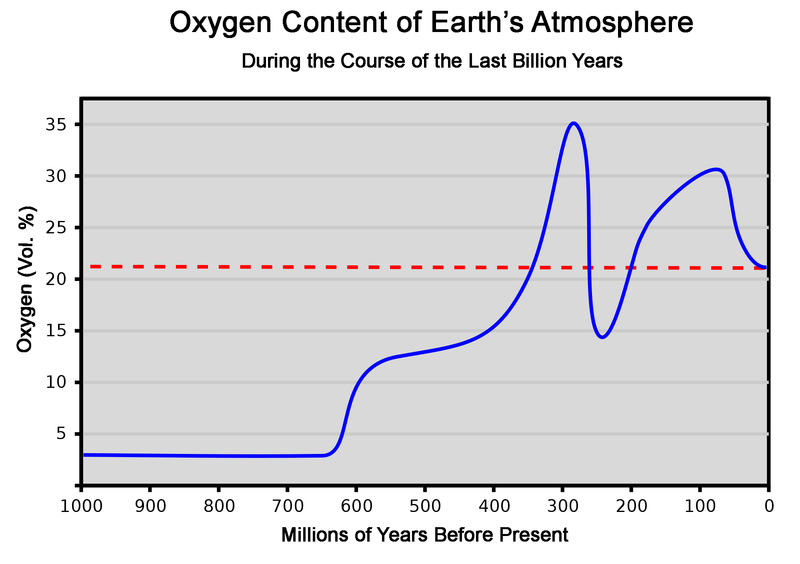 The atmospheric oxygen levels have not been constant on Earth, with some estimates that there was a significant increase as little as 600 million years ago. These past swings of oxygen levels are far greater than the estimated 0.01% change that man has caused over the last 10,000 years. We could pretty much cope if the oxygen content fell by 1%. However, if we did that by burning trees etc then we would increase the CO2 content of the atmosphere from about 400 ppm to about 10,400 ppm. I think even the most determined deniers of the anthropic greenhouse effect would accept that such a change would make a difference. (No doubt some would say it would best best thing since sliced bread). The fastest growing tree would produce the most oxygen still we cannot assume how many trees of what size would make a sufficient amount of oxygen for a human.So it is difficult to say what's the minimum number of trees needed for us. Is essentially equal to the amount of oxygen produced by the plants you eat. There is no need to grow a tree to offset the amount you breathe, unless you are eating trees. If we produce about 30 gigatons of CO2 each year, that means we are using about 10 gigatons of petroleum. Consider what it would take to store 10 gigatons of wood each year FOREVER... in a place where it would never rot, never be burnt. Just indefinitely stored. Coal, of course, could be replaced with a renewable resource such as wood or "hog fuel". However, our consumption outstrips our production which is why coal was invented in the first place. You'd be much better replacing the oil you burn in your car with a renewable fuel. Electricity derived from renewable resources, or some kind of a biofuel. Still, the typical American uses more fuel than the amount of food they eat. So, replacing all inorganic fuels with biofuels might mean doubling the amount of food production... a tall order, especially with a ballooning global population, as well as a growing global oil demand. That is one of the reasons why continued population growth anywhere is just unacceptable. If we switched *mostly* to electricity for our power, we could get nearly all of that from wind and sun. But occasionally it would be cloudy and still, and then you would need to kick in biofuel or natural gas generators. It's believed that there's enough wind power to power the world several times over, and there's definitely enough solar. But occasionally the wind would drop and the sun wouldn't shine, but because you'd be getting all the energy you need, 90% of the time, from wind and solar you'd need less than 10% of the land use you'd otherwise need to make the biofuel. It would less than double the cost of energy; you need two lots of generators, but then again, normal generators are often only running half the time anyway, due to maintenance and so forth, but it's a nuisance and expensive having to retire the old type and commision new ones. What creates the co2 from the carbon in the wood, is it micro organisims? Bacteria? The major decomposers (bacteria, molds, yeasts, bugs, etc.... can take wood and make CO2). Or, they will make Methane that eventually gets oxidized to make Carbon Dioxide. Without that, we'd be in bad shape. As it is, the CO2 in the air has been reduced to about 0.04%. It has dropped down to about 0.018% during the glacial periods. If plants didn't recycle the CO2, and it dropped further, then the current generation of plants would not survive, and potentially it could end all life on Earth. One of the problems that one encounters is that many of the traditional methods for generating power don't do well with variable loads. Solar generation can be somewhat predicted, although it does have problems with clouds. Wind can be sporadic, and change in power levels, even if some places tend to be windy a lot. A nuke plant may take days to cycle on and off. A coal plant also needs to be running at its optimum level, and may at least take a few hours to cycle on and off. I would think that hydroelectric would be fairly responsive to fluctuations, but one still must maintain the river flow, and the big generators apparently aren't designed for large changes in power generation. Perhaps one should redesign some of the hydroelectric generator plants... say have ½ or ¾ of the hydro plan doing a "background" generation, and then the rest optimized for fluctuating loads (using the river as a battery). Generally. bacteria can derive energy in 2 methods. Aerobic Bacteria derive energy from oxidizing hydrocarbons (with oxygen) to form carbon dioxide and water, somewhat like we do. Anaerobic Bacteria can survive in oxygen poor environments, and derive energy by breaking carbon-carbon bonds, generally making methane (CH4). Although, I think it is a bit more complicated than that. To make methane (CH4), one needs to add two Hydrogen atoms. Assuming no availability of free Hydrogen (H2) gas, these Hydrogen atoms would come from water. 2(H3C-CH3) + H2O --> 2CH4 + CH3CH2OH (Ethanol). Anyway, ever wonder what causes flatulence... it is the anaerobic production of methane (CH4). When released into an oxygen rich environment (the atmosphere), methane is no longer stable. With the interaction of sunlight and oxygen, it will spontaneously decompose. Atmospheric methane has been increasing slowly over the last few years, probably due to increased ocean temperatures (increasing the partial pressure of methane), and perhaps some release of methyl hydrates. Eventually it will reach a new steady state where methane release equals methane decomposition. It was pointed out... somewhere... that plant matter is a complex mixture of molecules, generally with functional groups such as esters, carboxylic acids, carbohydrates, etc, but the idea of reducing them to simple components is the same. Thanks for all that.What exactly is ethane, where does it come from?. Is this the main source of Methane? Ethane is an example of a two carbon chain. Perhaps not found a lot in life, but it is one of the simplest compounds with 2 or more carbon atoms. A fatty acid might have a 15 carbon chain with a carboxylic acid at one end. Often in Organic Chemistry, the Hydrogens are considered "fillers", but otherwise are ignored, and one only discusses carbons atoms, oxygen atoms, and etc. A better example might have been a simple sugar such as fructose. But, the process of reducing it to methane using water would be the same. What makes methane such a powerful greenhouse gas? Does it reflect heat better than co2? Or is it because it hangs around so long before it gets totally converted to co2 so that plants can absorb it-- in other words is it the slow release of co2 that's the problem? I found out that methane can absorb and release much more infra red radiation than co2 , it has nothing to do with the slow conversion to co2. It's actually a bonus that it does get converted, otherwise things could be a lot worse. I don't know how it's able to store the infrared, if it stores it by lifting electrons in to higher orbits or creating more spin, or higher molecule speeds, or something else i'm not sure of that. I'm also not sure how the infrared is released, and what the conditions must be. Might be temperature differences of it's surroundings at higher altitudes or simply collisions with colder molecules? Or is it when it gets converted to co2? Apparently it gets converted in the stratosphere by OH ions. This is the major conversion, so clifford's equation might also be right as there are other minor paths. BoredChemist,JP or SoulSurfer or clifford and the other experts,should be able to clarify all of this. Methane might be causing a major problem to the green house effect, in the melting of the permafrost, as it's getting released at a rapid rate now. Anyway it appears as if it's a very important molecule for people to understand.